It's been way too long since my little Sheldon has featured on my blog which is so strange because he's basically my life. So today I decided to give him his own little post because well just look at that face! Now I know you're thinking 'Jordan what the hell is that title, are you losing it?' so let's get into my reasoning! Of course I'm not giving out about Sheldon in any of the points mentioned below but more just stating the obvious, I love him very much and he is basically my child. They were also informed that 'they love to get out of their cage for a run around' the word 'run' is not in Sheldon's vocab (Yes I realise he is a guinea pig and so doesn't actually have a vocab but shush!) he'd much rather just lie down and stare at you while you try to encourage him to do well anything but that! Also don't even try to give him a nudge to get him moving unless you're feeling brave and want to lose a finger. Sheldon's favourite thing to do is eat. Literally he will not stop like every time I look at him he's eating. If he's not eating he's chilling and lying down because he's lazy. In the sitting room Sheldon has 'Sheldon's spot' (yes it's a thing #hatersgonnahate) and if you're sitting beside him on the sofa and decide to get up and walk into the kitchen you can bet your bottom he's whistling as loud as he can and will not stop until you bring him in some vegetables. Another thing Sheldon does is headbutt things, yes you've read that right! If you're holding him near your face he will headbutt that, if your legs are in anyway near him or god forbid in his way he'll headbutt them too. He also loves to headbut his wooden footballs against his cage at 3am because he obviously thinks it's hilarious giving me a heart attack at that time of night. He will also occasionally headbutt the sofa to try and get it comfy when he want's to snooze. If you pick him up to give him a hug he makes the most irritating giving out noise ever and he will just constantly do it until you put him back down. Yet when I watch videos of people with their Guinea Pigs none of them are like that and I'm just like what is your problem!? Out of all the Guinea Pig descriptions I've ever read Sheldon is basically the complete opposite of every single one of them. He also hops like a bunny, literally hops! I don't know what he thinks he is but he does definitely think he's bigger than he actually is. Of course though his little mood swings are adorable and you never know if you're going to get a kiss or almost lose a finger with him. However I would not change him for the world as I absolutely adore him! Every now and then he'll surprise me and be in such loving moods where he just wants to lie on me for hours and constantly give me kisses which just melts my heart. I also have thought him a few tricks throughout the time of having him and the only way to get him to do any of them is if you encourage him with food. Up above in one of the pictures you can see him standing because there was lettuce hanging above his head! He basically lives for food. I have two guinea pigs, they both constantly eat! But they have their own little personalities, one likes to explore and run and jump around, the other likes to sit there, and be cuddled. They are such adorable animals! 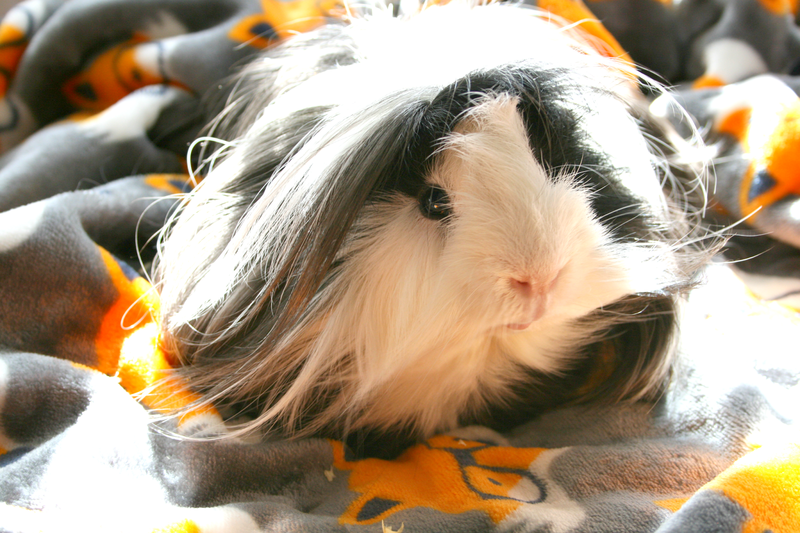 Sheldon is adorable, I love the long haired piggies!! My guinea pigs LOVE food too and they certainly don't do much in the form of exercise. They just sit there when they're having floor time. Some of my guinea pigs do the head butting thing too - I think it's adorable. Such a fun post to read and those photos of Sheldon are adorable! Sheldon is so cute,and he sounds exactly like the guinea pigs I used to own and I wouldn't have changed them either! oh my gosh is he adorable! I used to have two guinea pigs and I loved them very much! I laughed so much with this post! 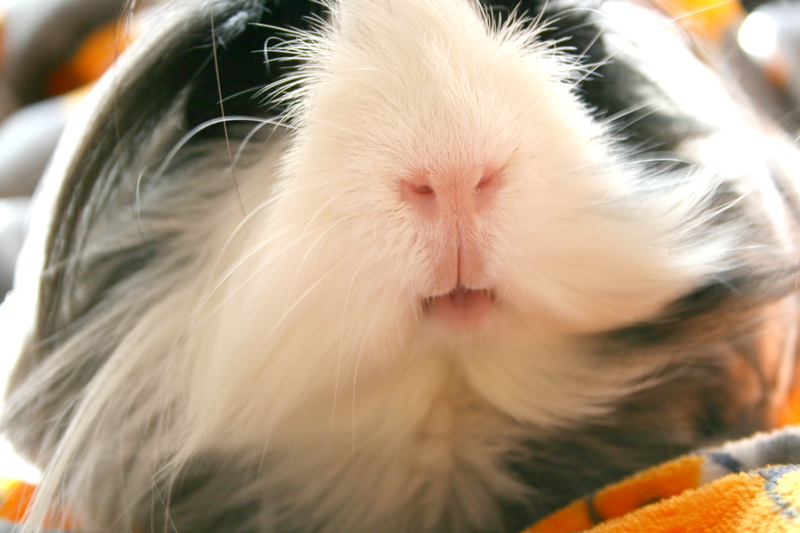 Your guinea pig has such an interesting personality. He's so pretty too! My guinea pig, Ren, is quite a handful but he loves to cuddle and he also likes to lick my fingers. Ahh, Sheldon is so adorable! 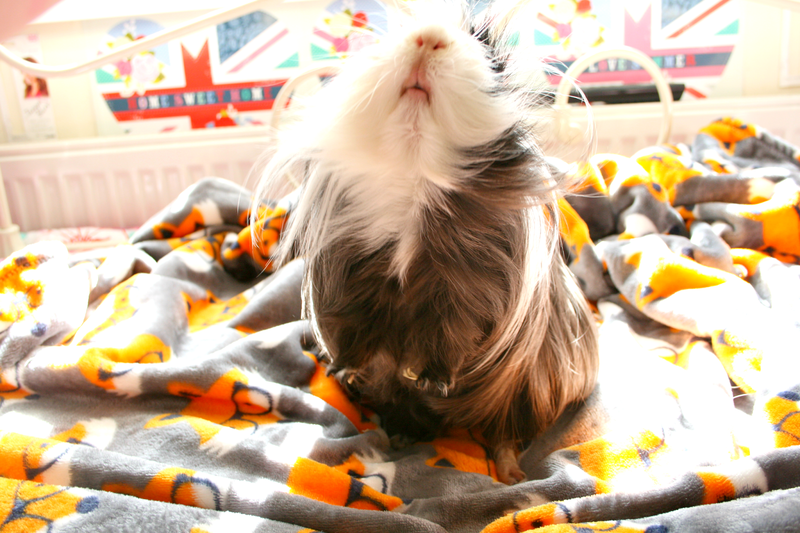 I love that he whistles until he gets vegetables - I guess that's one way he's like a classic guinea pig! I have two guinea pigs, Cotton and Fawn, and a tabby cat, Sorcha.